Smiles brighten with teeth whitening from San Marcos dentist, Dr. J. Robert Donnelly. Safe and effective whitening improves color for the new year. Do you resolve to improve the appearance of your smile in the new year? 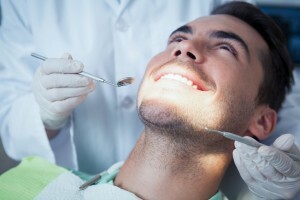 You can have a brighter smile in 2016 with professional teeth whitening from award-winning dentists, Dr. J. Robert Donnelly and Dr. Gregory Wang, at San Marcos Gentle Dental. Professional teeth whitening is a safe and reliable way to brighten tooth enamel stained by food and beverage choices, smoking and chewing tobacco, some prescription drugs and even the aging process. Teeth discolor because organic matter gets caught in the hard mineral matrix we call tooth enamel. As the matter accumulates over time, it yellows and mars the appearance of otherwise healthy teeth. Dr. Donnelly or Dr. Wang frequently whiten teeth before porcelain veneers and other cosmetic improvements so the color of all teeth are evenly matched. What is the whitening procedure like? After a complete oral exam to ensure the patient is a good candidate for whitening, Dr. Donnelly or Dr. Wang and their team perform the treatment right in the dental chair. Care is taken to cover the soft tissues of the mouth with a rubber dam so that the powerful hydrogen peroxide gel seeps only into tooth surfaces and causes no residual gum sensitivity. The patient relaxes in the dental chair while the gel lifts out the staining material. A special UV light activates the peroxide, enabling it to do its work quickly and effectively–hence the name, Zoom! whitening. Whitening finishes its work in just about an hour. The patient leaves San Marcos Gentle Dental with a smile that is dramatically whiter. With occasional touch-ups, hygienic cleanings at San Marcos Gentle Dental, good home brushing and flossing habits and limitation of staining foods, drinks and smoking, the new smile will stay bright throughout the new year and beyond. Would you like to learn more about this proven cosmetic dental service? Dr. J. Robert Donnelly or Dr. Greg Wang would be happy to discuss your cosmetic dental goals for the new year and help determine if professional teeth whitening is the correct choice for your healthy smile. Contact the staff at San Marcos Gentle Dental, serving the San Marcos and New Braunfels area, today.